Determined team: Chloe Burnham, front, second from left, with classmates from Our Lady of Dolours School, Mitchelton helped raise much-needed money for Diabetes Research. SHE can’t remember it well, but Chloe Burnham was at the beach with her family when the symptoms first started – nausea, headaches, and excessive trips to the toilet. Tests soon revealed that Chloe was suffering from Type 1 diabetes, a disease that would affect her on a daily basis, but never shape her as a person. Now a Year 6 student at Our Lady of Dolours School, Mitchelton, Chloe has tackled her challenge head on, not only managing her own wealth, but becoming an advocate for awareness and understanding for other Type 1 diabetics. “It’s something I’ve had basically my whole life, I want to use my experiences to educate others and raise awareness about Type 1 diabetes,” she said. Chloe has to check her blood sugar levels seven times a day and has to administer an injection every three days. Despite her vigilance she still experiences “lows” on a regular basis, resulting in short absences from school or even trips to the hospital. This is part of life for Chloe, who maintains a positive, infectious attitude that helps her own outlook and is now influencing the view of others on type one diabetes. Type 1 sufferers are commonly greeted with misconceptions such as being overweight, not exercising and having a poor diet, but are all tendencies for type two diabetes. Chloe said she never felt embarrassed of her condition with the understanding of friends and teachers at school, but understood the difficulties other sufferers go through, driving her to make a difference. In conjunction with her school and the Juvenile Diabetes Research Foundation, Chloe has become a Type 1 diabetes advocate through the JDRF One Walk initiative and a number of other school based fundraisers driven by her passion. “My biggest goal is to raise money to find a cure for type one diabetes, but awareness and education from others helps a lot with people’s understanding,” she said. 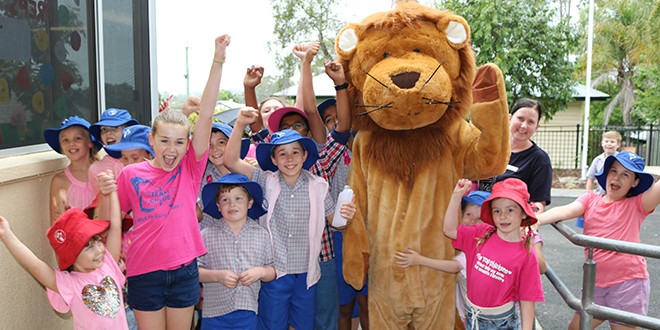 Together with the entire Our Lady of Dolours’ community Chloe embarked on her school’s One Walk around the streets of Mitchelton on October 28, even managing to get everyone to dress up in her favourite colour pink. “I think the boys secretly loved it,” she said. More than $3200 was raised from donations, as well as previous appeals on Facebook and the ever-popular lolly sales at the school. The total placed Chloe third in the state for money raised, an exceptional achievement for a small school community. Our Lady of Dolours’ principal Patrick Davis said resilience was the first word that came to mind when thinking of Chloe. “She always has her smile on and really embodies our statement – I can be me at OLD,” he said. Chloe will continue her journey when she starts school at Mt Alvernia College, Kedron next year and has already been in touch with staff about continuing her fundraising. While OLD will miss her presence, she has left behind a legacy as the school plans to continue their fundraising efforts for diabetes. “Anyone associated with OLD affected by diabetes will always be accepted as another member of our family and that’s because of Chloe,” Mr Davis said.